THE region round the little town of Kjøge is very bleak and cold. The town lies on the sea shore, which is always beautiful; but here it might be more beautiful than it is, for on every side the fields are flat, and it is a long way to the forest. But when persons reside in a place and get used to it, they can always find something beautiful in it,—something for which they long, even in the most charming spot in the world which is not home. It must be owned that there are in the outskirts of the town some humble gardens on the banks of a little stream that runs on towards the sea, and in summer these gardens look very pretty. Such indeed was the opinion of two little children, whose parents were neighbors, and who played in these gardens, and forced their way from one garden to the other through the gooseberry-bushes that divided them. In one of the gardens grew an elder-tree, and in the other an old willow, under which the children were very fond of playing. They had permission to do so, although the tree stood close by the stream, and they might easily have fallen into the water; but the eye of God watches over the little ones, otherwise they would never be safe. At the same time, these children were very careful not to go too near the water; indeed, the boy was so afraid of it, that in the summer, while the other children were splashing about in the sea, nothing could entice him to join them. They jeered and laughed at him, and he was obliged to bear it all as patiently as he could. Once the neighbor’s little girl, Joanna, dreamed that she was sailing in a boat, and the boy—Knud was his name—waded out in the water to join her, and the water came up to his neck, and at last closed over his head, and in a moment he had disappeared. When little Knud heard this dream, it seemed as if he could not bear the mocking and jeering again; how could he dare to go into the water now, after Joanna’s dream! He never would do it, for this dream always satisfied him. The parents of these children, who were poor, often sat together while Knud and Joanna played in the gardens or in the road. Along this road—a row of willow-trees had been planted to separate it from a ditch on one side of it. They were not very handsome trees, for the tops had been cut off; however, they were intended for use, and not for show. The old willow-tree in the garden was much handsomer, and therefore the children were very fond of sitting under it. The town had a large market-place; and at the fair-time there would be whole rows, like streets, of tents and booths containing silks and ribbons, and toys and cakes, and everything that could be wished for. There were crowds of people, and sometimes the weather would be rainy, and splash with moisture the woollen jackets of the peasants; but it did not destroy the beautiful fragrance of the honey-cakes and gingerbread with which one booth was filled; and the best of it was, that the man who sold these cakes always lodged during the fair-time with little Knud’s parents. So every now and then he had a present of gingerbread, and of course Joanna always had a share. And, more delightful still, the gingerbread seller knew all sorts of things to tell and could even relate stories about his own gingerbread. So one evening he told them a story that made such a deep impression on the children that they never forgot it; and therefore I think we may as well hear it too, for it is not very long. At length he become a journeyman; and then, for the first time, he prepared for a journey to Copenhagen, with his knapsack packed and ready. A master was expecting him there, and he thought of Joanna, and how glad she would be to see him. She was now seventeen, and he nineteen years old. He wanted to buy a gold ring for her in Kjøge, but then he recollected how far more beautiful such things would be in Copenhagen. So he took leave of his parents, and on a rainy day, late in the autumn, wandered forth on foot from the town of his birth. The leaves were falling from the trees; and, by the time he arrived at his new master’s in the great metropolis, he was wet through. On the following Sunday he intended to pay his first visit to Joanna’s father. When the day came, the new journeyman’s clothes were brought out, and a new hat, which he had brought in Kjøge. The hat became him very well, for hitherto he had only worn a cap. He found the house that he sought easily, but had to mount so many stairs that he became quite giddy; it surprised him to find how people lived over one another in this dreadful town. “Joanna will be very glad to see you,” said her father. “You have grown quite a nice young man, you shall see her presently; she is a good child, and is the joy of my heart, and, please God, she will continue to be so; she has her own room now, and pays us rent for it.” And the father knocked quite politely at a door, as if he were a stranger, and then they both went in. How pretty everything was in that room! a more beautiful apartment could not be found in the whole town of Kjøge; the queen herself could scarcely be better accommodated. There were carpets, and rugs, and window curtains hanging to the ground. Pictures and flowers were scattered about. There was a velvet chair, and a looking-glass against the wall, into which a person might be in danger of stepping, for it was as large as a door. All this Knud saw at a glance, and yet, in truth, he saw nothing but Joanna. She was quite grown up, and very different from what Knud had fancied her, and a great deal more beautiful. In all Kjøge there was not a girl like her; and how graceful she looked, although her glance at first was odd, and not familiar; but for a moment only, then she rushed towards him as if she would have kissed him; she did not, however, although she was very near it. Yes, she really was joyful at seeing the friend of her childhood once more, and the tears even stood in her eyes. Then she asked so many questions about Knud’s parents, and everything, even to the elder-tree and the willow, which she called “elder-mother and willow-father,” as if they had been human beings; and so, indeed, they might be, quite as much as the gingerbread cakes. Then she talked about them, and the story of their silent love, and how they lay on the counter together and split in two; and then she laughed heartily; but the blood rushed into Knud’s cheeks, and his heart beat quickly. Joanna was not proud at all; he noticed that through her he was invited by her parents to remain the whole evening with them, and she poured out the tea and gave him a cup herself; and afterwards she took a book and read aloud to them, and it seemed to Knud as if the story was all about himself and his love, for it agreed so well with his own thoughts. And then she sang a simple song, which, through her singing, became a true story, and as if she poured forth the feelings of her own heart. Nuremberg is a wonderful old city, and looks as if it had been cut out of an old picture-book. The streets seem to have arranged themselves according to their own fancy, and as if the houses objected to stand in rows or rank and file. Gables, with little towers, ornamented columns, and statues, can be seen even to the city gate; and from the singular-shaped roofs, waterspouts, formed like dragons, or long lean dogs, extend far across to the middle of the street. Here, in the market-place, stood Knud, with his knapsack on his back, close to one of the old fountains which are so beautifully adorned with figures, scriptural and historical, and which spring up between the sparkling jets of water. A pretty servant-maid was just filling her pails, and she gave Knud a refreshing draught; she had a handful of roses, and she gave him one, which appeared to him like a good omen for the future. From a neighboring church came the sounds of music, and the familiar tones reminded him of the organ at home at Kjøge; so he passed into the great cathedral. The sunshine streamed through the painted glass windows, and between two lofty slender pillars. His thoughts became prayerful, and calm peace rested on his soul. He next sought and found a good master in Nuremberg, with whom he stayed and learnt the German language. Silently he wandered on through the country of the Alps, which seemed to him like a fruit garden, covered with soft turf. From the wooden balconies of the houses the young lacemakers nodded as he passed. The summits of the mountains glowed in the red evening sunset, and the green lakes beneath the dark trees reflected the glow. Then he thought of the sea coast by the bay Kjøge, with a longing in his heart that was, however, without pain. There, where the Rhine rolls onward like a great billow, and dissolves itself into snowflakes, where glistening clouds are ever changing as if here was the place of their creation, while the rainbow flutters about them like a many-colored ribbon, there did Knud think of the water-mill at Kjøge, with its rushing, foaming waters. Gladly would he have remained in the quiet Rhenish town, but there were too many elders and willow-trees. Before him lay a large and splendid city, called Milan, and here he found a German master who engaged him as a workman. The master and his wife, in whose workshop he was employed, were an old, pious couple; and the two old people became quite fond of the quiet journeyman, who spoke but little, but worked more, and led a pious, Christian life; and even to himself it seemed as if God had removed the heavy burden from his heart. His greatest pleasure was to climb, now and then, to the roof of the noble church, which was built of white marble. The pointed towers, the decorated and open cloisters, the stately columns, the white statues which smiled upon him from every corner and porch and arch,—all, even the church itself, seemed to him to have been formed from the snow of his native land. Above him was the blue sky; below him, the city and the wide-spreading plains of Lombardy; and towards the north, the lofty mountains, covered with perpetual snow. And then he thought of the church of Kjøge, with its red, ivy-clad walls, but he had no longing to go there; here, beyond the mountains, he would die and be buried. He was walking one evening through the public roads, the country around him was flatter, with fields and meadows, the air had a frosty feeling. A willow-tree grew by the roadside, everything reminded him of home. He felt very tired; so he sat down under the tree, and very soon began to nod, then his eyes closed in sleep. Yet still he seemed conscious that the willow-tree was stretching its branches over him; in his dreaming state the tree appeared like a strong, old man—the “willow-father” himself, who had taken his tired son up in his arms to carry him back to the land of home, to the garden of his childhood, on the bleak open shores of Kjøge. 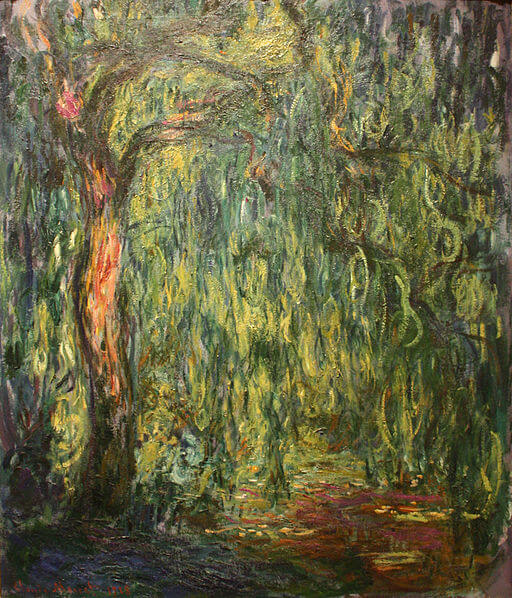 And then he dreamed that it was really the willow-tree itself from Kjøge, which had travelled out in the world to seek him, and now had found him and carried him back into the little garden on the banks of the streamlet; and there stood Joanna, in all her splendor, with the golden crown on her head, as he had last seen her, to welcome him back. And then there appeared before him two remarkable shapes, which looked much more like human beings than when he had seen them in his childhood; they were changed, but he remembered that they were the two gingerbread cakes, the man and the woman, who had shown their best sides to the world and looked so good. “We thank you,” they said to Knud, “for you have loosened our tongues; we have learnt from you that thoughts should be spoken freely, or nothing will come of them; and now something has come of our thoughts, for we are engaged to be married.” Then they walked away, hand-in-hand, through the streets of Kjøge, looking very respectable on the best side, which they were quite right to show. They turned their steps to the church, and Knud and Joanna followed them, also walking hand-in-hand; there stood the church, as of old, with its red walls, on which the green ivy grew. Add Under the Willow-Tree to your own personal library.